The digital assistant wars are in full swing, and with Google just recently notching the latest victory by finishing Q2 with the top-selling smart speaker in the world, Amazon is revamping its Alexa-powered roster in a very big way. At the start of its presentation, Amazon’s devices head David Limp set the tone by saying the company had around 70 new devices to talk about, and only an hour to do it. Limp then launched into talking about Amazon’s recent upgrades to Alexa, which in the U.S. includes making Alexa both more opinionated and more approachable for children and adults. Now, Alexa will know when to whisper a reply back, for those situations when you’re trying not to disturb others, and starting today, Amazon is adding routines to the Echo Dot Kids Edition to help parents create custom Alexa commands for their children. The new Dot looks like a mashup between the old model and a Google Home Mini. But the big reveal for Amazon are all the new Echo devices, headlined by an all-new Echo Dot. While the new Dot is retaining its affordable $50 price tag, it sports a new, rounded fabric-covered body with “louder and clearer” sound and both Bluetooth and line-out connectivity. To help supplement the Dot, Amazon also created the even cheaper (and thinner) Echo Input, which lacks speakers and is instead meant to be plugged directly into existing home audio solutions similar to Google’s Chromecast Audio. Not coincidentally, the Echo Input costs $35, the same as a Chromecast Audio. And for those who want to augment their speaker setups with a little more thump, Amazon also announced the $130 Echo Sub, which can be used for multi-room audio and synced with a pair of standard Echoes to create your own 2.1 system. Of course, the audio rabbit hole goes much deeper than just speakers and subs, so Amazon went and made the $200 Echo Link and $300 Echo Link Amp. Neither of these are meant to be standalone products and they don’t include a microphone. Instead, they connect to other Echo speakers and include a dial to help control and fine tune your audio, or in the case of the Echo Link Amp, help boost your sound quality. But we’re still not done yet, because in an apparent move to better compete against the HomePod and the Google Home Max, Amazon also announced the $150 Echo Plus, which looks vaguely like a HomePod with a blue light ring up top and a built-in smart home hub inside. On top of featuring better compatibility for smart home gadgets, the Echo Plus has what Amazon is calling Local Voice Control, which means that commands made to devices in your house no longer need to be sent to the cloud before making something happen. But what about all your existing “dumb” gadgets, you say? Well, Amazon thinks it has a solution for that too with the new $25 Amazon Smart Plug, which plugs into a traditional outlet and lets you turn devices on and off simply by asking Alexa. And to make sure setting all of these devices up is as hassle-free as possible, Amazon is touting a simple setup process that lets you rename a device with your voice during your initial install. That said, as useful as smart plugs can be, they are really best at enhancing simple things like lamps or fans. So Amazon says it also worked with companies including Kenmore, Moen, and Netgear to create a new smart home API that will allow companies to integrate Alexa into pretty much everything. Think showers, ovens, refrigerators, and more. This is where things started to go off the rails, if they hadn’t already, as Amazon proceeded to announce a new $60 Amazon Basics Microwave, which of course, has Alexa built in. Yes, you still have to put the popcorn in the box yourself, but if you’re too lazy to hit one button, you can ask Alexa to get the popping started. Then, the microwave was followed by the $30 Echo Wall Clock, which looks like something you might see in a classroom or cafeteria, and Alexa Guard, which is a home security system that works with Ring and ADT to send alerts to dispatch centers. Amazon also showed the $180 Ring Stick Up Cam, which is a wall-mounted security camera. Things returned to a semblance of normalcy with the announcement of an all-new $230 Echo Show, which has been redesigned with a significantly slimmer case, smaller bezels, and a much larger 10-inch screen. Like the Echo Plus, the Echo Show has built-in smart home hub functionality, and as part of the company’s ongoing partnership with Microsoft, Amazon announced Skype would be the first app to feature Alexa integration for voice calls. The new Echo show is much sleeker than before, even though it features a much larger 10-inch display. There’s still no official support for YouTube, but now that Amazon has added Firefox and its Silk web browser to the Show, it shouldn’t be too difficult to work around the Google/Amazon slap-fight. If you want more streaming media options, Amazon says the Show will also support watching stuff from Hulu, Food Network, Fox Sports, and others. At this point it seemed like Amazon was doing its best impersonation of the announcer from “The Price Is Right,” as it continued on with an announcement of the Fire TV Recast, which allows you to digitally record two to four shows at a time and them stream those shows to the new Echo Show or anything in your house connected to a Fire TV. But wait, there’s more! Because Amazon isn’t just trying to take over your house; they want Alexa in the car, too. 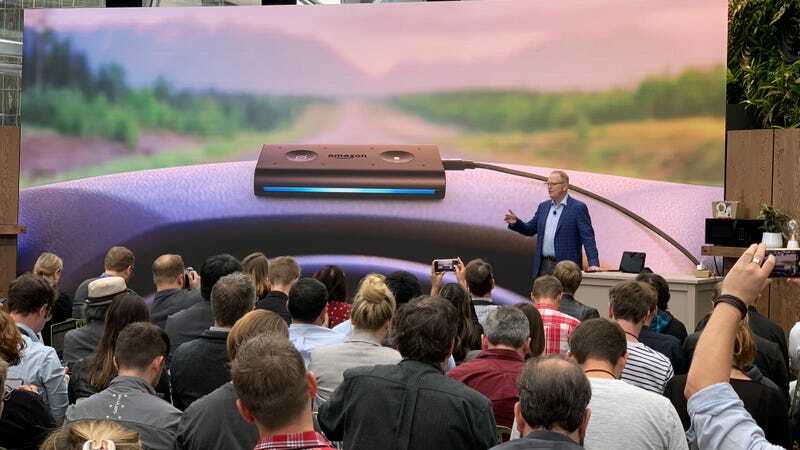 So now there’s the new $25 Echo Auto, which is a little box about the size of a deck of cards that sits on your dash and connects to your phone over Bluetooth so you can talk to Alexa in the car. Whew, that’s it for now. With the mountain of Alexa stuff announced today, it’s clear that Amazon’s strategy to take over the world is to simply drown us in as many Alexa-powered devices as possible. By my tally, this is at least 12 new Amazon devices. Pretty soon, Alexa-powered gadgets might grow sentient and just walk into your house and throw all your old, dumb gadgets out themselves. I hope you’re prepared.